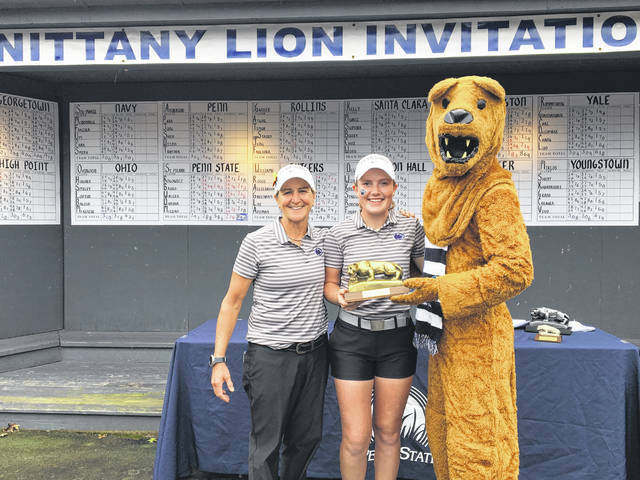 Sarah Willis (middle), a 2018 Eaton High School graduate, set a Penn State Nittany Lion Invitational Championship record with score of 205 (11-under) to earn medalist honors. UNIVERSITY PARK, Pa. — Penn State used an eye-popping 9-under final round of 279 to secure the 22nd Nittany Lion Invitational Championship in school history and its third in the last four years as the 42nd annual event concluded on Sunday, Sept. 23. On the individual side of things, freshman Sarah Willis (Eaton High School) took home some hardware. The rookie drained five-straight birdies to open her final round while adding an eagle on the ninth to earn individual medalist honors with a tournament record score of 205 (11-under). Willis registered three-straight rounds under par shooting 68 (4-under), 70 (2-under) and 67 (5-under) to earn her first collegiate victory in just her second event. Her final score of 205 is the lowest winning score in Nittany Lion Invitational history as well as the lowest 54-hole score in school history, three strokes clear of former Nittany Lion Ellen Ceresko who registered a 208 (8-under) during the 2012 NLI. Willis finished eight strokes clear of teammate Basso and Maeve Rossi of Rutgers who tied for second with scores of 3-under, 213. For her efforts, Willis was named the Big Ten Women’s Golfer of the Week. This marks the second consecutive year a freshman has captured the individual crown at the Nittany Lion Invitational and the third time in the last 10 years. Laura van Respaille captured individual medalist honors as a freshman for Maryland last year carding a 212 (4-under). The Nittany Lions trailed 16th-ranked University of Washington by four strokes entering the final round on Sunday morning and found themselves even further behind with only five holes remaining late in the afternoon. Penn State trailed by 11 shots, but played the final five holes at 9-under par while the Huskies dropped a pair of shots as the two teams tied with identical even par scores of 864 for the 54-hole tournament. The result of the tiebreaker was to calculate the teams fifth player score and with junior Ashni Dhruva (Katy, Tx.) carding a 76 (4-over) and Rino Sasaki of Washington finishing with a 77 (5-over), the Nittany Lions were crowned champions. Rutgers finished third at plus-15 (879) while Seton Hall (885) placed third and Xavier and Navy tied for fifth at 894. Senior Lauren Waller (Canonsburg, Pa.) helped turn the tide for the Nittany Lions in the late afternoon as she birdied four of her final six holes turning in a 4-under 32 on the back nine while tying the low round of the week with a new personal best five-under 67. Waller finished the tournament in fifth place with a three round total of 215 (1-under). Classmate Cara Basso (Downingtown, Pa.) turned her even par Sunday into a 2-under round of 70 with back-to-back birdies at 17 and 18. The senior finished the tournament in a tie for second at 3-under (213). Junior Megan McLean (Lebanon, N.J.) also added some late round heroics recording birdies on five of her final eight holes to finish with a 2-under round of 70. McLean along with senior Jackie Rogowicz (Yardley, Pa.) each finished the tournament in a tie for seventh at 2-over (218). The Nittany Lions next travel to the Princeton Invitational next Saturday, September 29 and Sunday, September 30.